Magento Marketplace Free Shipping : Magento Marketplace Free Shipping module provides free shipping to the customer. The seller can manage the free shipping by setting the minimum order for free shipping. Using this module seller can provide the free shipping facility to their products. Specific countries can be chosen by the admin for free shipping. With the help of this module, sellers can ship their products without any shipping cost. Magento Marketplace Free Shipping - Magento Marketplace Free Shipping module provides free shipping to the customer. The seller can manage the free shipping by setting the minimum order for free shipping. Using this module seller can provide the free shipping facility to their products. With the help of this module, sellers can ship their products without any shipping cost. Important Note - This module is an add-on of Marketplace Module. 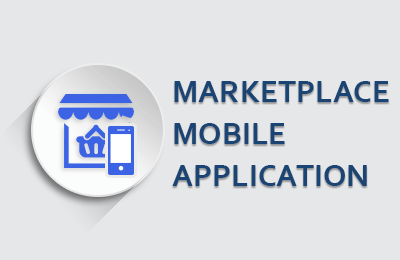 To use this module you must have installed first Webkul Marketplace Module. The seller can provide the free shipping method for their products. The seller can manage free shipping by setting the minimum order for free shipping. Specific countries can be selected for free shipping. The admin can enable or disable this add-on from the back-end. The admin can set the “name”, “title” of this shipping method from the back-end. Free Shipping management can be provided to the sellers by the admin. After the payment, the admin can see all the orders for any particular seller by going to “manage seller” tab. The admin can approve the order by going to “manage order” tab and after approving the order, status of the order changes from “Pending” to “Processing”. The admin can enable or disable free shipping management for sellers. Allow admin to approve any order. Admin can enter Name and Title of the shipping module. 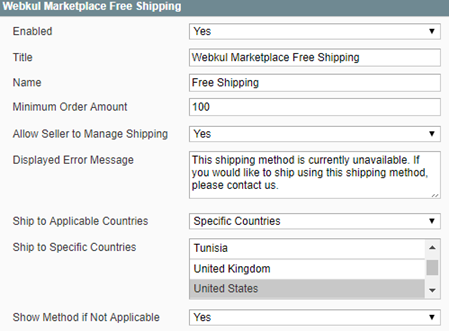 The admin can choose countries which will be eligible for free shipping. Magento Marketplace Free Shipping module provides free shipping to the customer. The seller can manage the free shipping by setting the minimum order for free shipping. Using this module, the seller can provide the free shipping facility to their products. With the help of this module, sellers can ship their products without any shipping cost. After the order is placed, the seller can go to “my product list” and view the “quantity sold” for that particular order. On clicking on the “quantity sold” number, the seller can see the product with “invoice” option. After the order is placed, the seller can go to “my product list” and view the “quantity sold” for that particular order. On clicking on the “quantity sold” number, the seller can see the product with “invoice” option. Free shipping is provided by online seller/vendor to increase the sales and traffic of their store. It is one of the best way to attract the customer. 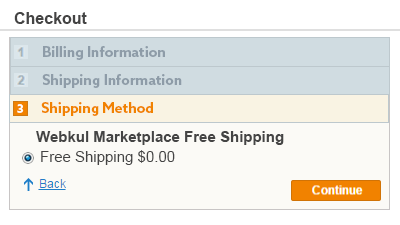 So for Webkul marketplace, we have provided an add-on called Magento Marketplace Free Shipping. When this shipping method is enabled from the back-end, buyer can opt for Webkul marketplace free shipping in the check out page. Generating Invoices and Tracking No. Using Magento Marketplace Free Shipping module, seller can generate tracking no. After the approval of the order seller can generate the invoice. After generating invoice, seller can set the tracking number, shipping details and save it. Now the order status will be “complete”. Seller can even cancel the order. 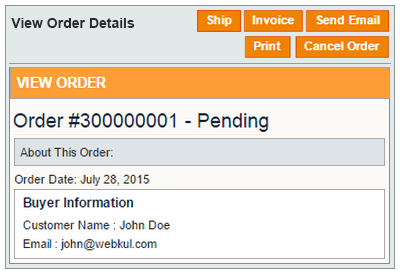 Allow seller to download/print the invoice and shipping slips. Did you buy Magento Marketplace Free Shipping?